Paradigm: distinct concepts in any scientific discipline or other epistemological context; a new study that challenges the current evolutionary paradigm. Epistemology: a branch of philosophy that investigates the origin, nature, methods, and limits of human knowledge. 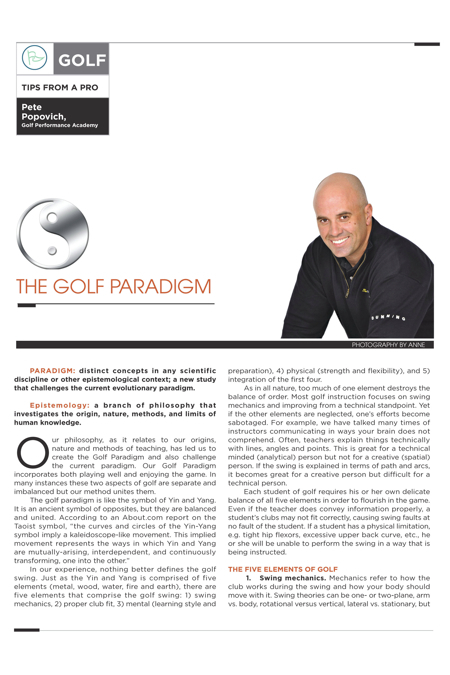 Our philosophy, as it relates to our origins, nature and methods of teaching, has led us to create the Golf Paradigm and also challenge the current paradigm. Our Golf Paradigm incorporates both playing well and enjoying the game. In many instances these two aspects of golf are separate and imbalanced but our method unites them. In our experience, nothing better defines the golf swing. Just as the Yin and Yang is comprised of five elements (metal, wood, water, fire and earth), there are five elements that comprise the golf swing: 1) swing mechanics, 2) proper club fit, 3) mental (learning style and preparation), 4) physical (strength and flexibility), and 5) integration of the first four. As in all nature, too much of one element destroys the balance of order. Most golf instruction focuses on swing mechanics and improving from a technical standpoint. Yet if the other elements are neglected, one’s efforts become sabotaged. For example, we have talked many times of instructors communicating in ways your brain does not comprehend. Often, teachers explain things technically with lines, angles and points. This is great for a technical minded (analytical) person but not for a creative (spatial) person. If the swing is explained in terms of path and arcs, it becomes great for a creative person but difficult for a technical person. Each student of golf requires his or her own delicate balance of all five elements in order to flourish in the game. Even if the teacher does convey information properly, a student’s clubs may not fit correctly, causing swing faults at no fault of the student. If a student has a physical limitation, e.g. tight hip flexors, excessive upper back curve, etc., he or she will be unable to perform the swing in a way that is being instructed. 2. Club fitting. Proper club fitting is critical. If the club does not fit you specifically, you will never reach your potential. Improperly fit clubs do not allow you to swing consistently. They force you to manipulate the club, and as we have said before, you cannot learn to manipulate consistently. Proper club fitting goes far beyond lie boards and shaft flex. (Most “club fitters” would argue this.) Misfit clubs create an imbalanced swing, which can also cause injury. 3. Learning style and preparation. This refers to how you best learn—visually, linguistically or kinesthetically—as well as how you, as an individual, process information. It also deals with how you prepare to play. Not only does information have to be given in a manner you can comprehend and process, the way you go about practicing and preparing must coincide with your learning methods. (Creative people should never hit the same shot repeatedly while practicing. It is contrary to how their brains work.) Each student must have a personal practice plan so he or she can progress at a consistent level. If a practice plan is not given or, worse yet, is given in the wrong manner, progress will stop or even regress. 4. Physical. Strength and flexibility—physical balance is essential to gain total swing balance. Again the Yin-Yang symbol applies. Are you too strong on one side? Less flexible on your left than on your right? A full assessment is required to know where you are physically imbalanced. If you have physical limitations, how are you going to improve your mechanics? It may be as simple as one side of a tight neck causing loss of rotation, which in turn leads to missed shots. 5. Integration. This refers to the student’s ability to finally understand, develop and blend the first four elements into a unity of form and function to produce a swing in which all facets are in harmony (like that kaleidoscope movement mentioned above). It also demands a teacher who can recognize the anomalies in any of the four basics and show the student how to proceed toward balance. You could have the best-fit clubs, be flexible and strong in all the right places, etc., but if you do not understand how and why information best works for you, you will have difficulty enjoying the game and lose half of the Golf Paradigm’s benefit. Learning how to utilize all five elements of the Golf Paradigm is essential to shooting lower scores and getting more enjoyment out of your game. It is important that an instructor understands how each element works and how they relate to one another. Simply knowing swing mechanics is not enough. At the Golf Performance Academy-Hilton Head, we take pride in our continued research. It is second to none. If you are not enjoying and improving your game or have not received answers to all your questions regarding the lack of improvement, contact the Golf Performance Academy-Hilton Head at 843-338-6737, e-mail pete@golfacademyhiltonhead.com or Facebook at Golf Performance Academy-Hilton Head.